Ever since I was a wee-mid-teen, I’ve wanted to go to Chester. I studied Roman history for my A-levels and we had to do a section on Roman Britain. Chester, with its excavations, featured in my studies in such a way that I had rather a romantic image of it. I mean, Britain is not exactly blessed with magnificent Roman remains, and we have to be satisfied with the mildly and moderately interesting. So, now I’m a wee-mid-thirties, I finally made it in July 2017 to the by now quite mythical Chester. Now the added interest came in knowing that the town is essentially medieval, and the idea that it’s walled, and the timber structures and the fact that it’s so close to Wales… I was totally charged up to fall in love. It was in the AD 70s that a Roman fort (castrum) was built by the Legio II Adiutrix in an area that had belonged to the Celtic Cornovii tribe. It was called Deva Victrix and became one of the major forts in the country, which in turn led to its becoming a major civilian settlement. It was apparently 20% bigger than those built around the same time, like York and Caerleon which has led some to suggest that Chester was the intended capital of the province of Britannia. Well, it wasn’t – though it flourished fine until around AD 410, when the Romans officially withdrew from the country, leaving the locals behind to take advantage of the fortress to protect themselves from the raiders who came from the Irish Sea. Once the Romans left, it is thought that Chester became a part of nearby Powys, and in 616 the awesomely named Æthelfrith of Northumbria defeated a Welsh army and established the Anglo-Saxons in the area. They strengthened the walls to try and protect the city from the Danes, but the Danes got through – though only until King Alfred seized all the cattle and laid waste to the land and drove them out. Interestingly, Chester was also one of the last English cities to fall to the Normans, and the castle that was subsequently built was intended to both defend the town and intimidate the Welsh. The rare importance of Chester as a Roman hub means that its museum has some fantastic items of display. For those who are interested in the Romans in particular, there are two rooms dedicated to the remains from the fortress of Deva, but those who are generally interested in the history of Chester will also find it worth visiting. To read my rather more lengthy entry, please click here. The amphitheatre is touted as being the largest found in Britain – but that doesn’t mean that there’s much to see of it. The Roman Garden is a charming place to potter around, with local Roman remains brought in to make things more interesting. Again for my post on that (not very long at all) please click here. The cathedral is a gem of a building – for me, it was the highlight of the city. The 14th century choir stalls, the memorials, the stained glass windows… it all makes for a wonderful way to spend a few hours – especially if there is choir practice, like when I was there. For my post on the cathedral, please click here. The Middle Ages served Chester well, and there are still many medieval buildings in the city – though some of the black and white buildings are actually Victorian. However, the Rows, as they’re called, are not only unique, they are very attractive and extremely sensible – they basically consist of covered walkways which lead to shops on the first floor, leaving room for further shops on the ground floor. The first reference to the elevated walkway was in 1356 so basically the buildings have largely been in continuous use from at least that time. The City Walls are also a unique feature of Chester. Originally built to defend the city, their construction was started by the Romans with the establishment of Deva Victrix. They were built during the 2nd/3rd centuries, using sandstone, but there’s not much of the Roman work left. The walls must have fallen into disrepair, meaning that when Æthelflæd improved them, a few centuries later, this would have entailed large scale work. The walls were then extended to form a full circuit of the medieval city by the middle of the 12th century. The total length of the walkway along the walls is 1.8 miles. The upkeep of the walls was always problematic and expensive. The money came from murages – a specific tax in the Middle Ages which paid for the upkeep of defensive walls – however, keeping up with the repairs was obviously a problem and in 1641 the walls were described as being ‘ruinous’. In the early 1640s, the walls were repaired in preparation for the Civil War, and the Parlimentarian siege of the city saw the walls breached in two places. Subsequently the city has not needed the walls for protection, and they quickly became popular with tourists instead. In the 18th century Samuel Johnson and John Wesley walked the walls and improvements were made to ensure that they were accessible to walkers. Similar work has basically been going on ever since. The Nine Houses, Chester, England. Only six remain. They were 17th century Almshouses, restored in 1969. The walls provide a great way to see the city, not least because you are at a better height to see the buildings. There are regular spots where you can join/escape the loop, so even if you can only walk a small part of it (like me) it’s still worth it. A word of warning though: sometime you’re really quite high. And sometimes, the sides are really quite low. If you are not good with heights, you may want to plan your route so that you know you’ll be able to cope. The River Dee flows from Wales and briefly saunters into England, before rushing back into Wales and escaping into the sea. It served as an important trade route from at least the Roman era and these days it’s possible to do little pleasure trips along the river during the right seasons. By the river is a promenade called the Groves. Even though the weather had turned by the time we made it there, the many ice-cream booths were doing brisk business. There was also an empty bandstand, which I’m sure is occupied by local musicians belting out brass classics on sunny days. In the picture above, you can just about see the Old Dee Bridge. It is the site of an original Roman bridge, but the current version is mainly from the 1300s. Made out of the local red sandstone, it’s a dinky little structure and very picturesque, with some pointed and some rounded arches. It’s quite different from the 1920s suspension bridge up river. The part of the church that is still standing and functioning was closed when we got there, which was a shame, because it’s supposed to be a real gem. Anyway, we were able to walk around the atmospheric remains of some chapels which were once joined on to the church, which was a good way to finish the day. 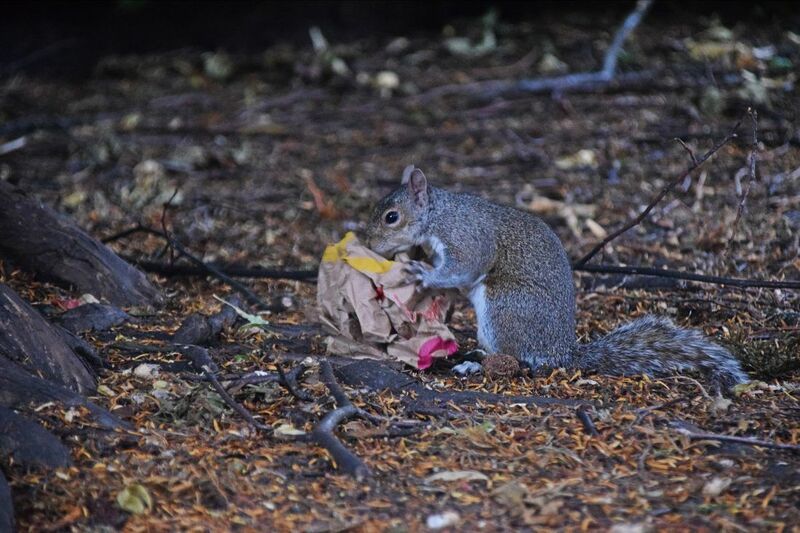 Probably one of the saddest things I’ve ever seen: a squirrel feverishly trying to get into a bag of McDonalds. My advice, to any person who values their sanity: don’t go to Chester on a race day. If you are a race-goer, maybe you should ignore the next sentence or two, because I have to be honest: I have never been so grossed out by so many people in my life. The tottering drunks trying to stay upright in their stilettos as they swigged Prosecco was not something I wanted see. It kind of ruined the day for me, actually. That is not to say that Chester is not an interesting place, and certainly it is an attractive town with its timbered buildings and Victorian renovation – it’s just there was a part of me that thought that if the town grew wings and moved to Europe, it would be allowed to retain more of its innate character. Partly I think it’s because the high street is full of your usual high-street names, which makes it feel like a generic town with its prettiness wasted rather than highlighted. It’s a real shame – especially since the people were sweet and friendly, and I just couldn’t help feeling that everyone deserved more in this historically and culturally fascinating town. It’s definitely worth consulting the excellent Chester tourism website – it’s full of information about what to do and what’s on: www.visitchester.com. I particularly appreciated the section “Chester on a Budget”.